2018 is coming in as the fourth hottest year since records began and the second costliest year ever for extreme weather impacts. It wasn’t an outlier. According to NOAA and NASA the twenty warmest years on record have all occurred since 1995; the five hottest have all come in the 2010s. Meantime, our ocean – which absorbs 30% of the world’s greenhouse gas emissions – is warming and becoming more acidic faster than any time in the last 300 million years. We are seeing catastrophic impacts on our coral reefs as the first indicator of this acid bath. The equivalent of one garbage-truck a minute dumping plastic waste in the sea adds to the intolerable stress we are placing on life under water. Meanwhile much of life on land is facing mass extinction – the WWF 2018 Living Planet Report shows, incredibly, that humanity has wiped out vertebrate populations across animals, fish and birds by 60 percent on average between 1970 to 2014. We cannot ignore these facts. They have enormous implications for our economy, society and politics. Of the nine billion people that will soon inhabit the planet, more than two-thirds will live in cities, often in coastal areas. Many children born today – even those in relatively richer countries – will quite literally not be able to weather the storms, pollution and collapse of nature that lie ahead. “Hothouse Earth” could trigger a hotbed of anger. You may feel you have heard this all before. Maybe. But perhaps you didn’t hear this bit. Scientists told us two incredible new things in 2018. First, we have just twelve years left to keep global warming within 1.5 degrees Celsius if we are to avoid dangerous climate change. 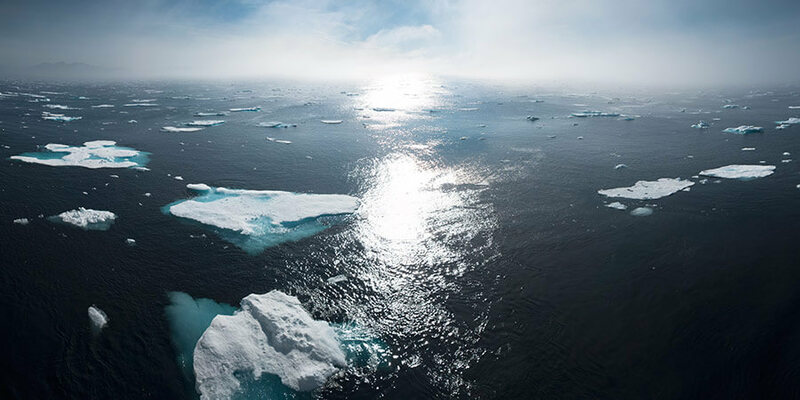 Second, and as a result, we are getting dangerously close to crashing ourselves out of the Holocene era – the not too hot and not to cold “goldilocks” equilibrium in Earth history we have enjoyed for the last 12,000 years and which has allowed us humans to flourish. Through our own doing, we have been pushing all the boundaries for planetary instability. The good news is we may not be as dumb as Jane Goodall fears. The hard exit from the Holocene might be avoidable. This is linked to how our global politics is changing. Driven by the Fourth Industrial Revolution, Globalization 4.0 is forcing our old global conventions to give way to new ones; and for top down governmental ways of doing things to morph into more agile, “multi-actor” arrangements. The push back against rising inequality and job insecurity, driven by the global forces of technology change, is forcing domestic leaders to think again about how international agreements work and who should be involved to make them better. This revolution is sweeping through the global environmental agenda too. The old order, which is proving insufficient to deliver the scale of environmental action we now need is giving way to the new. Firstly, we have realized that governments and international organizations, while vital for agreeing global targets like the Sustainable Development Goals and the Paris Climate Agreement, cannot deliver them all alone. No matter how much money an environment ministry is given, it cannot solve these problems on its own. Instead, we are recognizing it will take an unprecedented level of collaboration and innovation involving many outside the public sector to trigger the big, systemic changes required to achieve these ambitious goals. The good news is that most in the environmental agenda now agree. Secondly, and as a consequence, we are seeing – after years of unwillingness from international environmental diplomats to throw open their doors – a sea change in public-private and civil society collaborations to help solve our most pressing environmental problems like climate change, ocean health and biodiversity loss. What were once viewed a bit condescendingly as non-state-actor “side events” at big government summits are now seen as the main-stage examples of environmental action. And thirdly, with the rapid technological advances of the Fourth Industrial Revolution, we will also be able to harness new means of monitoring, verifying and reporting the progress (or not) of global, regional and industry actions on climate and the environment– potentially through radical new forms of distributed information transparency and real time disclosures. Such increased transparency will increase awareness and the pressure to act. Ironically, just as the desire for international cooperation starts to fracture, such new technologies are helping to put global environmental action collaboration and pollution disclosure on steroids. Perhaps also driven by necessity, this opening up of the global environmental agenda for new partnerships to combine with new technologies, is breaking down our old environmental order and shaping a new approach to secure our global environmental commons – a New Deal for Nature is on the rise. Many of the partnership building blocks already exist: they include international public-private partnerships like the Tropical Forest Alliance 2020, RE100, the Energy Transitions Commission, the WRI-C40 Coalition for Urban Transitions, the Food and Land Use Alliance, the Platform for Accelerating the Circular Economy, the Friends of Ocean Action, the Global Battery Alliance, Grow Asia, the Alliance of CEO Climate Leaders and the new Global Plastics Action Partnership. At our recent Sustainable Development Impact Summit in New York, we helped many of these and others to “accelerate” their reach and impact. Many businesses and governments already understand the benefits of joining collaborations like these. Working together in partnerships allows more to be achieved than if each worked alone. The Carbon Pricing Leadership Coalition and the 2030 Water Resources Group are good examples of sustainable, national market-building at work through public-private collaborations. More companies, more governments and more young people must join or add to these efforts. The next step will be to encourage new clubs of like-minded governments, sub-national jurisdictions and new platforms for policy and public-private partnership to also emerge, for example in the “hard to abate” industry sectors like cement, steel, chemicals and shipping. Many younger people concerned about the environment, and at the beginning of their career path, also realize that championing innovations in the sustainability sector can offer them the chance of a lifetime. While their elders may have created or joined campaign groups and NGOs, many younger entrepreneurs are harnessing today’s technologies to create a slew of purpose-based business models, B-corps and other innovation-driven solutions to help solve the climate and environmental crisis. The Forum’s Global Shapers community, active in almost 400 cities in more than 150 countries, for example, contain many of these new tech-savvy environmental champions. Together, they form a new innovation ecosystem for environmental action. They are starting to put it to use. Taken together, this represents a kind of Schumpeterian disruption for the existing environmental agenda. New collaborations, new innovations and new networks of entrepreneurs are challenging the way that institutions set up 50 years ago or so have traditionally gone about managing our global environmental issues. But for the kind of radical transformation that the science says we need, such positive disruption is surely a good thing: old job boundaries are breaking down, enabling new collaborations across civil society groups, business, investors, city administrations, universities, technology centres and innovation accelerators to take off, each seeking to reshape the economy of environmental protection and reinvent business models to reap sustainable rewards. Our task is to shake up the system to help make this happen. We start at the Annual Meeting in Davos this week. If South Africa maintains a “business-as-usual” approach to water resources management, it will face a 17% gap between water demand and supply by 2030. This supply-and-demand gap can damage economic growth and derail efforts to bring clean water and sanitation to its poorest communities. The 2030 Water Resources Group (2030 WRG)—through South Africa’s Strategic Water Partners Network (SWPN)—has been facilitating collaborative action between South Africa’s Department of Water and Sanitation, the private sector, civil society, and other relevant stakeholders to address their common water challenges. This innovative approach to addressing water security issues was recognized during the Partnership for Growth (P4G) Summit in Copenhagen, which took place on October 19 and 20, 2018. SWPN was one of the three partnerships that earned a 2018 State-of-the-Art Partnership of the Year Award. 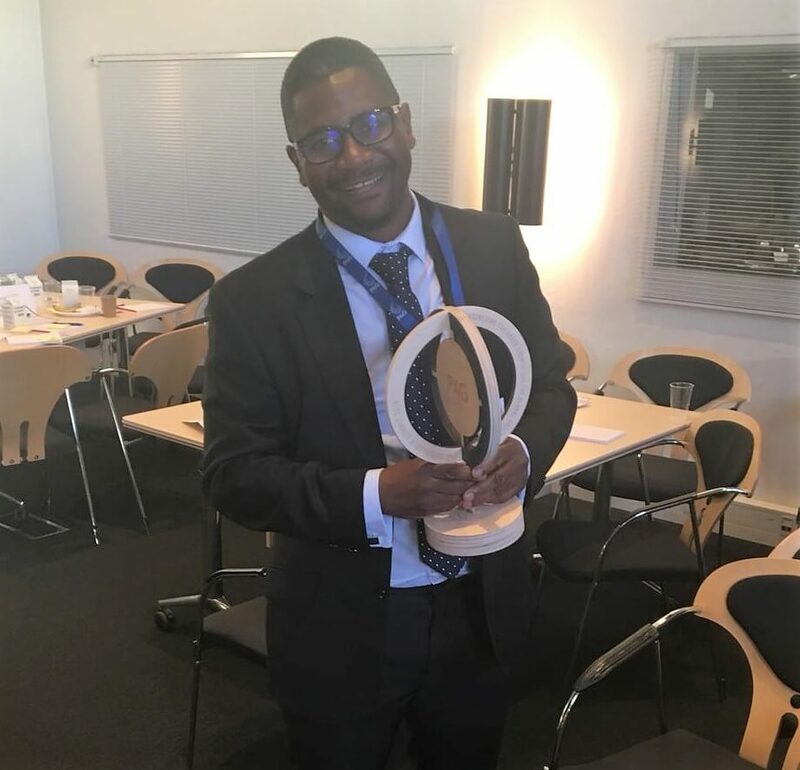 Nick Tandi, Africa 2030 WRG’s regional coordinator, accepted the award on behalf of SWPN. During the summit, Mr. Tandi addressed an audience of over 500 delegates hailing from different countries around the world, and spoke specifically about the need for stakeholders in South Africa to co-create solutions for South Africa’s imminent water challenges. Read SWPN’s news release here. October, 2018 – At the recent World Economic Forum Sustainable Development Impact Summit, held at the end of September in New York, 2030 WRG organized a side-event that served as an opportunity to showcase the work and impact of 2030 WRG through partners’ stories. Laura Tuck, World Bank Vice President Sustainable Development, offered some remarks on the positioning of water in the 4IR space, the importance of pushing advancements in water, harnessing disruption and exponential change and accelerating demand-side management through value-chains to make impact. She was followed by Bea Perez, Senior Vice President and Chief Public Affairs, Communications and Sustainability at The Coca Cola Company, who offered insights into the benefits to the multi-stakeholder approach, and involvement into 2030 WRG. Shamima Akhter, Sustainability Head for Coca Cola in Bangladesh, then spoke in more detail about her experiences at the country-level, in Bangladesh, working alongside 2030 WRG Steering Board partners. She spoke about agricultural challenges, coordination challenges, and opportunities for collaboration and scale. ABInBev Director of Water Sustainability, Andre Fourie, then shared his experience with embedding innovation in collaborative water management, specifically in Africa. Minister Gugile Nkwinti from the Water and Sanitation Department of South Africa, subsequently shared how from a government-standpoint, we need to leverage public, private and civil society partnerships altogether, to tackle the challenges from the front-lines, against a backdrop of economic growth, policies and frameworks that support transformation at scale, and valuing water. Mercedes Castro, Peru 2030 WRG partnership Steering Committee Chair, CEO of Agualimpia NGO, and former Peru sherpa to the UN High Level Panel on Water, then explained how best to deal with realities on the ground, including changes in governments, as we have recently witnessed in the case of Peru. She shared how the Peru collaboration has elevated the MSP to a high-level decision making body where many other decisions are taken now as well as the platform proved to be versatile in its delivery and mechanism and a great, neutral place where relevant stakeholders can come together to talk about concrete projects. Manual Sager, Director-General for the Swiss Development Cooperation (SDC), finally shared with the participants how he sees 2030 WRG as incubators for such 4IR and technological innovative projects, to test and showcase how successful projects can be replicated and scaled for transformative impact. Moderator, Jane Nelson, Director of the Corporate Responsibility Initiative at the Harvard Kennedy School, then led the discussion on overcoming obstacles in transforming value chains, how 4IR can help reduce demand for water, thereby ensuring communities and the environment have sustainable water, how collective action can achieve impact at scale and how to ensure that inequalities are not deepened more in society. Desde hace unos meses me encuentro en la Universidad de Harvard, realizando un Programa Internacional de Liderazgo Avanzado. 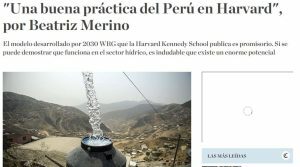 He advertido desde aquí, con orgullo, como Harvard Kennedy School, su renombrada Escuela de Gobierno, observa con particular interés y publica un estudio sobre una plataforma de actores múltiples que existe en el Perú y que está abocada a apoyar a los gobiernos a acelerar reformas sostenibles en torno al agua. Tengo el honor, además, de formar parte del Consejo Directivo en el Perú de esta iniciativa llamada 2030 Water Resources Group (2030 WRG). El Perú es uno de los 11 países en los que está presente. ¿Cuál es la clave? En mi percepción, 2030 WRG ha ejecutado una metodología eficaz. Ha logrado propiciar y poner en práctica aquello que parece necesario en toda transformación social: el diálogo constructivo. Para legitimarlo ha recurrido a otro principio fundamental: el involucramiento de todos los sectores atañidos de la sociedad, compleja tarea en un tema como la gestión del agua, convocando y motivando a actores clave y con capacidad de toma de decisión. Y un elemento final e indispensable del método: una rigurosa base de evidencias y análisis. This year, the Global Compact Brazil Network and the CEO Water Mandate organized an event to bring together the Brazilian private sector, government, NGOs, and other organizations seeking to address water risks in Brazil to discuss water security challenges and solutions. The event, titled “Collaboration for Water Security in Brazil,” took place on March 19, in parallel with the 8th World Water Forum in Brasília, Brazil. 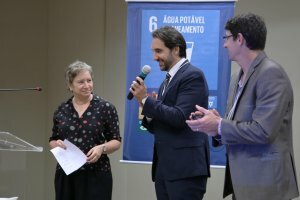 One significant outcome of the event was the partnership announced between the Global Compact Brazil Net, the CEO Water Mandate, and the 2030 Water Resources Group in São Paulo. Since mid-2017, the 2030 Water Resources Group has been working to advance water security in São Paulo through projects to reuse effluents from domestic sewage treatment stations and projects to improve the performance of sanitation services in small and medium-sized municipalities. The partnership formed during the 8th World Water Forum event will focus on advancing water security in Brazil through water reuse and the circular economy. It will take coordinated action from a variety of stakeholders, including the private sector, government, and civil society, to meaningfully advance water security in Brazil. The Water Action Hub provides companies and others with the ability to connect to projects happening near them or find potential partners for future water stewardship action. Water insecurity poses one of the greatest risks and leadership challenges of our generation. It threatens the well-being and livelihoods of millions of people. It has started to undermine food, energy and industrial production and damage economic growth prospects in many countries. It raises the spectre of failing systems, large-scale involuntary migration, political instability and conflict. Demand for water is expected to exceed supply by 40% by 2030. New technologies, financing mechanisms, delivery models, voluntary standards and policy and regulatory innovations will be required to address this growing gap. Governments must take the lead in enabling these activities and making tough choices to allocate water resources among different uses and users. To be effective, however, they will need to consult and cooperate more strategically with stakeholders in business and civil society. In the absence of such collaboration, it will be impossible to achieve the type of technical, behavioral and political changes that are needed to improve water governance at global and national levels, as well as in water management and local use. The 2030 Water Resources Group (2030 WRG) demonstrates what is possible. The 2030 WRG was established in 2008 as an informal consortium of some of the World Economic Forum’s members, including the IFC, McKinsey & Company, the Barilla Group, The Coca-Cola Company, Nestlé, New Holland Agriculture, SABMiller, Standard Chartered Bank and Syngenta. Today, it has evolved into a multidimensional, public-private partnership with country-led implementation platforms at its core. Hosted by the World Bank Group, its mission is “to help countries achieve water security by 2030 by facilitating collective action between government, the private sector and civil society”. Through multistakeholder platforms in 14 countries and states, some 600 organizations from different sectors are working together on projects and policy reforms with support from the 2030 WRG team. They range from operational projects, such as agricultural, industrial and municipal water use efficiency, to strategic initiatives, such as urban-industrial security and river basin governance. The collaborative approach has helped to build trusted relationships between different sectors as well as across silos within government and industry. In Peru, for example, five ministers serve on the country’s WRG steering board. The highest levels of government have made commitments in Bangladesh, Karnataka and Maharashtra. In South Africa and Mongolia, agricultural, mining and manufacturing companies are cooperating individually and through industry associations. Efforts are underway to increase engagement with civil society organizations, farmers and citizens. Government in the lead: The multistakeholder approach offers an alternative to what has primarily been a public sector role when ultimate responsibility still rests with government. A core priority of the approach is to help address the capacity gaps and overcome the political constraints that many governments face in managing water resources effectively and transparently. Local ownership and collaboration from business and civil society: Greater inclusion and decision-making by local business and civic leaders have been essential in identifying shared priorities, designing feasible solutions and creating the incentives and buy-in needed for implementation. A combined focus on data and analysis, stakeholder dynamics and the political economy of change: The 2030 WRG has learned the importance of balancing rigorous data and a technical understanding of water challenges with an appreciation of the institutional and political context. In addition to highlighting water security as a potential constraint on economic growth, it considers social and environmental concerns to generate a sense of shared urgency among diverse stakeholder interests. Strong ‘backbone support’: A challenge of many multistakeholder platforms is that they unite parties who are at best unfamiliar and at worst distrustful of each other. Backbone support from a team that has the ability to stimulate, coordinate and support collaboration among such parties is essential. It requires a combination of technical expertise alongside the ability to think long-term, live with uncertainty, and learn and adapt along the way. Vital roles for individual champions: Individual leaders have been essential to the evolution of the 2030 WRG. They have ranged from government ministers to corporate CEOs and practitioners from the participating organizations. Many have taken real, personal risk, investing their time, effort, influence, networks and, in some cases, reputation as vocal supporters for a collective effort they do not control and the outcomes of which are uncertain. The 2030 WRG offers a promising approach to tackling the complex, systemic challenges of achieving water security and resolving shortages in the world’s most essential resource. If it can demonstrate the effectiveness of systems leadership and collaboration in the water sector, there will be enormous potential for this kind of approach to have a broader role in expediting progress towards achieving the Sustainable Development Goals. This draws on the findings of a report on the 2030 Water Resources Group published by the Corporate Responsibility Initiative at Harvard Kennedy School. Mongolia has two major water consumption areas – Ulaanbaatar and the southern Gobi region. The first has population pressure, while the second is where mining and economic activity will become more and more intense. 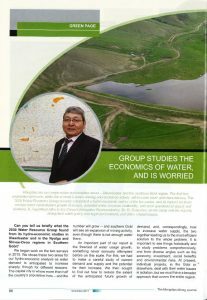 The 2030 Water Resources Group recently conducted a hydro-economic survey of the two areas, and its reports on them contain water consumption growth forecasts, potential water resource availability, and such questions of supply and demand. this footprint is an indicator that defines the total amount of water used to produce goods and services. Interestingly it takes into consideration both the direct and indirect consumption in the whole productive process. 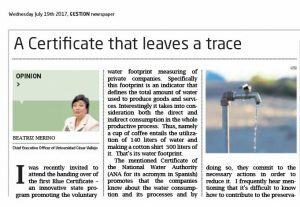 Thus, namely a cup of coffee entails the utilization of 140 liters of water and making a cotton shirt 500 liters of it. That’s its water footprint. promotes that the companies know about the water consumption and its processes and by doing so, they commit to the necessary actions in order to reduce it. I frequently hear mentioning that it’s difficult to know how to contribute to the preservation of nature and its resources. Here is a so very tangible initiative for this. It’s simple, efficient, accurate and available. We know the reasons why it’s so imperative to take care of the water. However, beyond saving and preserving it, this venture turns out to be particularly valuable for the commitment that involves these companies assignment with the sustainable management of the resources, and that is remarkable. Within the complex reality as it is ours (Lima is a desert) for the water resources management and in a complex scenario after El Niño, it’s rewarding to spot how some initiatives are emerging, which for their simplicity and scalability call up several sectors of the society and have them come together, such as: the state, the private sector, and the international cooperation. This program that is supported by the 2030 Water Resources Group’s Board of Directors in Peru aligns with the United Nations’ Sustainable Development Goals, to the OCDE’s water governance, but above all, it shares the government vision to count on safe water and to achieve a water and sanitation supply for all the Peruvians towards year 2021. Antoine de Saint Exupéry: “the essential is invisible to the eye”.